25 additional Nashua Police officers were called in as backup. 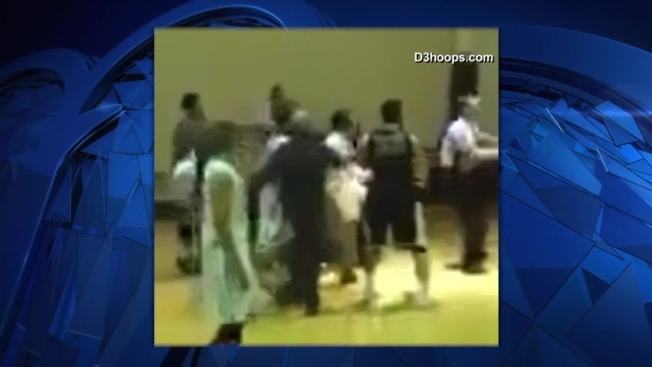 A New Hampshire college basketball game led to an altercation on the court and three arrests on Saturday in Nashua. Officer John Hannigan of the Nashua Police Department was working security for a Daniel Webster College basketball game when he witnessed an assault. Twenty-two-year-old Marquise Caudill allegedly attacked a player from the opposing team. Officer Hannigan tried to stop the assault and make an arrest when Caudill threatened him. Another woman, 43-year-old Elizabeth Morris, intervened, positioning herself between Caudill and Officer Hannigan, preventing him from making the arrest. At the same time, another player on the basketball team, 23-year-old Antwaun Boyd, was reportedly inciting the crowd, encouraging them to keep Officer Hannigan surrounded. The officer called for backup and 25 Nashua Police officers responded to help control the mob. Boyd, Caudill, and Morris were all arrested and taken into custody. Boyd received charges for disorderly conduct. Caudill was charged with second degree assault, criminal threatening, and disorderly conduct. Morris is charged with obstruction of government administration. Daniel Webster College posted on twitter today that Saturday’s game would be the last men’s basketball game in the school’s history.